hwy 559 to Adams road. Go all the way to near end of Adams rd and into gates of Estates of Auburndale. Go to the first right at the round about and go straight until the road runs out, left on Costa Loop, house on right. Hello, I’m interested in 169 Costa Loop and would like to take a look around. 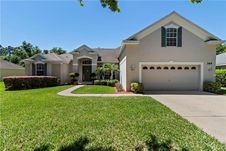 The details on 169 Costa Loop: This house located in Estates of Auburndale, Auburndale, FL 33823 is currently for sale for $321,900. 169 Costa Loop is a 2,899 square foot house with 5 beds and 4 baths that has been on Estately for 3 days. 169 Costa Loop is in the Estates of Auburndale neighborhood of Auburndale. This house is in the attendance area of Auburndale Senior High School, Walter Caldwell Elementary School, and Jere L. Stambaugh Middle School. Listing Courtesy of: MFRMLS and CENTURY 21 MYERS REALTY.